Visit John Coyne at Global Pouch West, December 5-7th. 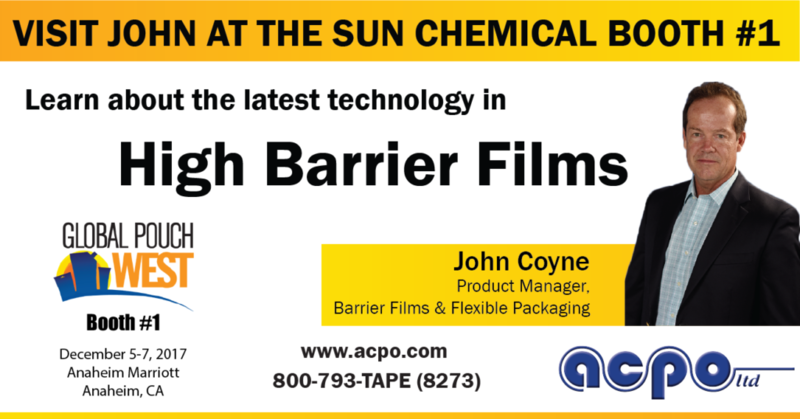 Stop by the Sun Chemical booth #1 at the 2017 Global Pouch West event in Anaheim, CA and learn about the exciting new products that acpo, ltd offers to the flexible packaging industry. Our Flexible Packaging Product Manager John Coyne will be available to discuss your needs and answer your questions. This entry was posted in Announcement, Flexible Packaging, News on December 5, 2017 by Tammy Calhoun.